Alba reported a surge in net income for the first half on the back of stronger sales despite what the company said were headwinds. Net Income for the second quarter stood at BD29.8 million compared with BD15.2 million in Q2 2014, an increase of 96 per cent. Sales for the second quarter were BD199.3 million compared with BD193.6 million year on year. The board has recommended an interim cash dividend of 5.5 fils per share, which is BD7.9 million, to be paid this month. “Alba was able to outperform the industry and continue to deliver on safety. We plan to use this positive momentum as we gear up for the Line 6 Expansion Project which will make Alba the largest single-site aluminium smelter in the world,” said the company’s chairman, Sheikh Daij bin Salman Al Khalifa. The expansion will increase Alba’s capacity by 514,000 tonnes to reach 1.45 million tonnes. Bechtel Canada completed the bankable feasibility study for the $3.5 billion expansion project last December. DX+ Technology is selected as the base for Line 6, while JP Morgan, Gulf International Bank (GIB) and National Bank of Bahrain (NBB) are the financial advisors of the project. The company is seeking a credit rating ahead of talks with banks about fundraising for its $3.5-billion Line 6 expansion, a company official told Reuters. Global aluminium demand continued to grow in Q2 with world consumption up by 5 per cent year on year; however, a significant drop in physical premiums and LME prices is expected in the second half of 2015, the industry feels. World production rose by 7 per cent and LME inventories were at 3.5 million tonnes in June. The LME cash average was at $1,769 per tonne in Q2 2015 compared with $1,798 per tonne for the same period last year. As well as Line 6, the company is focusing on safety, training and development initiatives programmes. It pledges to deliver on Project Titan and have a sustained focus on value-added sales. Project Titan, launched in 2014, is a two-year efficiency programme whose objective is to reduce cash costs by $150 per tonne by the end of January 2016. At the end of June 2015, the programme has unlocked $129/tonne of savings and Alba is on track to achieve the set target of $150/tonne by January 2016. Alba recently marked the 10th year of operations of its Reduction Line 5. 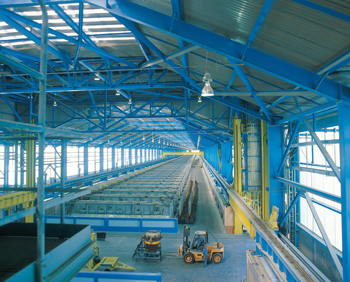 Inaugurated by His Royal Highness the Prime Minister, Prince Khalifa bin Salman Al Khalifa, in 2005, Line 5 was a historic milestone in the Middle East’s aluminium industry. It expanded Alba’s annual aluminium production by 307,000 tonnes making it the largest aluminium smelter in the world outside of Eastern Europe with a total output of 827,000 tonnes per year. Line 5 set the world record for the fastest and safest start-up of an aluminium reduction line of 77 days without a single loss time injury. At 1.2 km, Line 5 was also the world’s longest reduction lines back then with 336 pots using one of the most advanced technologies – AP30. To date, Line 5 produces more than 345,000 tonnes yearly of liquid metal as compared to its original capacity of 320,000 tonnes. Over the last decade, there has been a remarkable 8 per cent growth in its production capacity, majority of which has taken place in the last three years with minimal investment and by using internal resources. Alba will embark on a new journey with the Line 6 Expansion Project. Expected to begin production in early 2019, the project upon full ramp-up will bring Alba’s total production capacity to approximately 1,450,000 tonnes per year making it the largest single-site smelter in the world upon completion. The company has been declared a winner in the Environmental Best Practice category of the prestigious International Green Apple Awards 2015. The 2015 award ceremony will be held on November 16, 2015 in The Houses of Parliament, United Kingdom, where the Gold, Silver and Bronze awards in each category will be announced. One of the world’s foremost environment award campaigns, the Green Apple Environment Awards recognises, rewards and promotes environmental best practice around the world. “At Alba, environment, along with employee safety and health, is a key area of our vision. We continuously strive to maintain a sustainable development by investing in greener initiatives and developing cleaner technology. This win brings international recognition to Alba’s commitment towards creating and maintaining a sustainable environment, thus fostering a healthy work environment for its employees,” said Murray. Alba also won the Gold Award for Occupational Health and Safety in the RoSPA Occupational Health and Safety Awards 2015. Its Europe sales manager, Boris Santosi, received the award on behalf of the company during a ceremony held at the Hilton Birmingham Metropole Hotel at the National Exhibition Centre, UK. As part of its continued efforts to create and maintain employee safety and health awareness, Alba launched the ‘Go to Work and Come Back Home Safe’ campaign. It kick-started with a presentation by Alba’s chief operations officer, Isa Al Ansari, only for the female staff, during which he focused on home safety using real-life examples. A key aspect of this campaign is the involvement of employees’ children in all communication such as posters and short films to convey messages of safety. An edutainment booklet on work and home safety will be distributed to all employees.